Make sure that the walls you’ll be stenciling are properly prepared! It makes no sense to put your beautiful artwork over a poorly prepared surface. Walls should be clean, dust free and in good condition. Any cracks or chips should be repaired, filled, primed and painted prior to stenciling. Base coat paint should be allowed to dry for at least 24 hours before stenciling. We recommend a Flat sheen base coat paint for best results. You can stencil over eggshell sheen as well but the general rule is, the higher the sheen of the base coat, the more potential for paint seepage to occur. We do not recommend stenciling textured walls as paint seepage can occur. The use of spray adhesive is not necessary but for some more delicate stencils or stencils with large cutouts it can be helpful. Spray adhesive is recommended for ceiling stenciling. When stenciling, we usually use a low tack painters tape such as 3M blue tape to avoid pulling up any base coat paint. For walls, mask off the baseboards, moldings, ceilings and those surfaces that will not be stenciled Burnish (rub down) the edge of the tape for a cleaner line with less paint seepage. Always remove your masking tape slowly, pulling it an an angle. Start at the ceiling line in an area that will allow you to do a full column, from ceiling to floor without any windows or doors in the way. Use several pieces of low tack painters tape to secure the stencil. Don’t use regular white masking tape as it’s way too sticky and can pull off the base coat when you move your stencil. Don’t bend the stencil, trying to fit it into the ceiling crease. Simply tape it flat to the wall right next to the crown molding or ceiling line, which should be masked off with low-tack painters tape. Use our innovative Clip On Stencil Level to keep your stencil rows level. The level is so lightweight it can stay clipped to the stencil throughout your entire project. Once you’ve completed a full column, use the built in registration described below to start filling in left and right. For ceilings, the method is the same but we do recommend the use of spray adhesive in addition to the low tack painters tape to help hold the stencil in place. This is a super fast way to get the job done. Perfect for walls! Pour your stencil paint into a tray and EVENLY load your Dense foam roller. We don’t want a blotchy looking roller. Once your stencil roller is evenly saturated with paint, off load the excess paint by rolling it a couple times on folded paper towels. If the roller leaves stripy lines on the paper towels, reload the roller so it’s evenly coated and then off load it again on your folded paper towels. The roller should appear somewhat dry. Remember, It’s always better to have less paint on your roller because too much paint can cause paint seepage under the stencil. Start rolling and slowly build up paint coverage using light to medium pressure. Don’t push too hard as this can cause paint bleed under the stencil. Carefully un-tape and pull back a corner of the stencil to see if your paint coverage is satisfactory. Reload and off load the roller as necessary. All Cutting Edge Wall Stencils have a built in registration that makes alignment easy. This means that the stencil aligns with previously stenciled elements. This alighnment method is very easy to use and very Intuitive. An alignment diagram is shown in each stencil description on our website. Once you’ve completed a full column, use the built in registration described above to start filling in left and right. No need to wait for the previous print to dry: if you’re using flat paint this should not be an issue as the paint dries very quickly. For ceilings, the method is the same but we do recommend the use of spray adhesive in addition to the low tack painters tape to help hold the stencil in place. When all walls are done, it’s time to fill in the gaps in the pattern left at the ceiling line. This is done using a Top Edge stencil designed just for that. You can finish the pattern with your large stencil too, but it's much easier and less cumbersome with our Top Edge stencil, which is included with those wall stencils that need it. For baseboards, window and door moldings simply mask off the moldings and bend the stencil into the crease, using pieces of tape to help secure it if necessary. Roll right into the crease and then use a Stencil brush to detail the edge. In general, select your stencil brush size based on the size of the stencil openings. The smaller the openings - the smaller the brush. For edges and corners a regular size stencil brush (1/2” or 5/8”) works well. To load the stencil brush with paint: dip just the brush tip into the paint (only about 1/8”) and then swirl it on the tray to evenly distribute the paint into the bristle tips. Off-load the excess paint onto some folded paper towels. Like the roller, the brush should appear almost dry. Pouncing (straight up and down motion) works great for filling in areas with color. You can stencil your walls using stencil brushes, but it’s clearly much more time consuming than stenciling a wall with a roller. Select the largest stencil brush if you want to go this route. This is achieved by masking off the opposite wall, and bending the stencil into the corner. Secure the stencil with tape only on the side of the wall that you are stenciling, and roll right into the corner. Then use a stencil brush to get deep into the corner crease to fill in all the openings. Once you have completed the first wall all the way down, tape off the wall you have just completed. 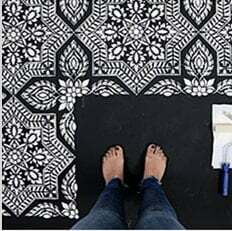 Then, starting at the top, align the stencil with your completed wall, secure the part of the stencil on the unpainted wall with tape leaving the other half loose, and continue stenciling on the next wall.